It seems as though most of my photography students find themselves asked to photograph a wedding. If you’ve never shot one, and often, even if you have, this can be a rather intimidating venture. After all, you are only dealing with the day the bride has dreamed about her entire life. No big deal. If you find yourself in this position, do not freak out, here’s the best advice I can give you as a wedding photographer: Have fun! “What? Have fun? That’s not what I was expecting?” Yeah, I know… but here is the simple truth of the matter. Everyone loves pictures. The bride hired you because she wants good pictures. If you are stressed, she knows the pictures are bad. (Simple fact… you could be stressed because you have a hang nail… doesn’t matter. Pictures are still bad.) If she feels that the pictures are bad, she starts to stress out. When the bride stresses out, everyone stresses out. When everyone stresses out, there are no more good pictures. Thus, a stressful photographer is the first step towards wedding disaster. Have fun! Do not stress about apertures and shutter speeds. Shoot in RAW. Set your white balance to Auto. Let your camera make decisions for you. Focus on the people, and yeah… have fun! If you have the capacity, sure, take control of the f/stop, shutter speed, and ISO. Tweak away, making each image a visual masterpiece, but if you find yourself spending more time on your camera than on your people, you may have already started down the slippery slope. Yup! 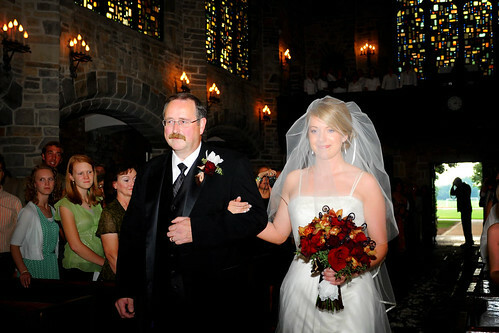 That's me, stalking the bride and her father from down the aisle at a gorgeous wedding. Many thanks to Joy (Jensen) Phillips for the image! Check back next week for How to Photograph a Wedding | Group Portraits! i always enjoy your thoughts and insight. looking forward to the next post! Thanks so much for these great tips, Rowan! They came just in time and shall be very useful as I prepare for my first wedding job... Can't wait to hear and learn more.